PRICES RANGE FROM �,605 to �,750 for the petrol-powered 1.2/1.4-litre built-in-Britain models. There's also the option of the Jazz Hybrid (which is made in Japan) with its 1.3-litre IMA petrol/electric powertrain and priced from �,300 to �,335. I've just had a spell in the Jazz Hybrid  not the best-selling version because of its high purchase price, but they do save money on running costs. For owners, it is just a case of doing the sums. Another financial consideration for some motorists is the all-important feature of an automatic transmission  and the Jazz Hybrid has a CVT autobox as standard. The official figures show the Jazz Hybrid 1.3-litre/electric-assist version will return 62.8mpg in the Combined Cycle with CO2 emissions of 104g/km; meaning road tax is �for the first year then, as an alternatively fuelled car, � per annum. Company car drivers will pay 11% BIK tax. When it comes to performance the 1.3-litre Jazz Hybrid has the combined petrol engine and electric motor figures of 100bhp, 147lb ft of torque, 109mph and 0 to 62mph in 12.1 seconds. The most significant difference to petrol-only powered models is the extra torque provided by its electric motor, which makes the Jazz Hybrid's petrol/electric drivetrain more responsive and smoother in the midrange  exactly the right area most drivers need for our UK country and urban roads. The extra torque also smoothes out the gearchange steps from the 6-speed CVT transmission; and the engine doesn't sound stressed under acceleration  a typical feature of CVTs. My test drive in the Jazz Hybrid, using mainly its ECO setting mode and covering the usual motorway journeys and trips into town plus country lane, was an impressive 54.4mpg. This is not close to the official figure but better in real-life conditions than I would get from the 1.2/1.4-litre petrol models. The Hybrid employs a fairly simple hybrid system with the electric motor element only involved in boosting power as an assist to the petrol engine, and giving an increase in performance and improving fuel economy. However, this still doesn't get the Jazz into the sub-100g/km which would exempt it from road tax costs all together as well as from the London Congestion Charge. And neither does the Jazz Hybrid have the facility or battery capacity to allow it to run full-time in electric vehicle only mode for zero emission zones  it can though, if the conditions are right, run automatically in electric power only for a very short distance. The Jazz, Honda likes to think, is targeted at young families either as their main transport or as a second car for 'mum's family bus duties'. In reality, from my experience, it is the older generation empty-nesters who appear to be the main customers. These people appreciate the easy access, the comfortable seats, the ability to carry whatever long or heavy loads they need, the easy parking, plus that it's reliable and cost effective to run and it looks youthful as well. 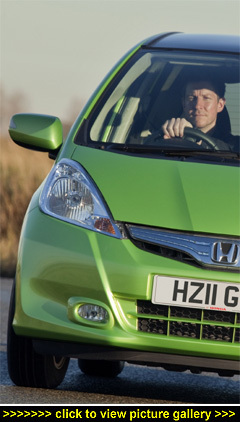 Less mobile and Motability users can carry whatever walking or transport aids they need in the Jazz's cavernous (300 to 1,320 litres) load space and, of course, the automatic transmission is also a significant reason to purchase one; if not the Hybrid, the 1.4-litre model will also meet their requirements. As for fixtures and fittings, my Jazz Hybrid had the midrange HS specification and is priced at �,810. For this money the specification includes automatic climate control, cruise control, electric windows and door mirrors, fabric upholstery, front fog lights, plenty of front, side and curtain airbags, height-adjustable front seats, adjustable steering column, on-board computer, paddle-shift gear change, remote central locking, 15-inch alloy wheels, and much more. Another neat touch: as a prompt to driving economically, the well-positioned instrument panel glows green! Against? More pricey to buy than petrol-only models, unsettled ride quality, no facility or battery capacity to select EV driving mode only, does not get under the important 100g/km CO2 level, no spare wheel  there's just no space for it. And while the Jazz might hit the right notes, it can be a bit Soul-less to drive.